You know how to copy and paste: first you copy, then you paste. The idea was revolutionary when Apple introduced it in 1984, but it had one big limitation: namely you could only paste the very last thing you copied. That limitation remains to this day, and it’s a problem, because sometimes you copy something, but get distracted before pasting, and then you copy something else, wiping the first thing off the clipboard. Then you have to go back and copy the first thing again so you can paste it. Imagine you have an email message that you’d like to use as the starting point for a new email. You want to copy the subject of the email, and you also want to copy part of the body. Without Paste, it’s copy the subject from the old email, switch to the new message and paste the subject, then switch back to the old email, then copy from the body, then switch to the new email, and paste. I’m tired just writing about it. But with Paste, you would copy the subject and parts of the body, then go to the new email and paste both parts in. Easy, and after you’ve done it this way you will wonder how you lived the old way. The “you-can-only-paste-what-you-last-copied” problem is solved by an app called Paste. Paste extends the concept of Copy and Paste by allowing you to save unlimited copied things and paste them anywhere, in any order, at any time. It’s powerful and elegant, and it’s quickly become a “can’t live without” thing for me. I think it’ll be the same for you. The developer describes Paste this way: Paste keeps everything you’ve ever copied and lets you to use your clipboard history anytime you need it. You get a chance to customize things when Paste runs for the first time, as shown below. Change the “Activate Paste” hotkey to something that works for you (the default is Command-Shift-V, but I like Control-P). Make sure Paste runs at startup, and enable Direct Paste. Set the history capacity number to anything you’d like. You’ll see a tiny little Paste icon in the menu bar when Paste is running. Use that to access Paste’s preferences later, in case you change your mind about that hotkey. Paste’s screen. Click for larger version. This example shows three images and one chunk of text, each copied at different times. The text is the oldest of the four things copied and there are many more items to the right. Access those older items with the right-arrow on the keyboard, and access newer items with the left-arrow. You will quickly get used to NOT worrying about having to paste something right after you’ve copied it. You can copy a URL from a web page, then a picture from Photos, then some text from an email, and paste it all later. Paste takes care of everything. You can create collections of copied items to help keep things organized. (Paste calls these collections “Pinboards.”) It’s easy to make a new pinboard– just click the large “+” at the top of Paste’s window and name it. Adding items to pinboards is easy too– bring up Paste, then control-click on the item you’re interested in, and “pin” it to a pinboard. The item stays in the main collection but can also be found in the pinboard (click on the pinboard at the top of the Paste screen). Nice touches abound in Paste, showing a lot of thought and care by the developer. For example, by default, Paste does not store information copied from Keychain Access or 1Password. Also, things are color-coded in Paste: stuff copied from Safari is blue, stuff copied from Contacts is brown, stuff copied from Pages is purple. App icons are also shown in each item’s title, and you can see quickly whether the copied item is text, an image, or something else. 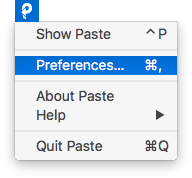 You don’t need this, but it makes Paste nicer to use. You can search within Paste by clicking on the magnifying class and typing a few words in. If you search for “image” you get just images. If you search for “text” you get just text snippets. You can also search for items copied from a particular program by searching for the program name. 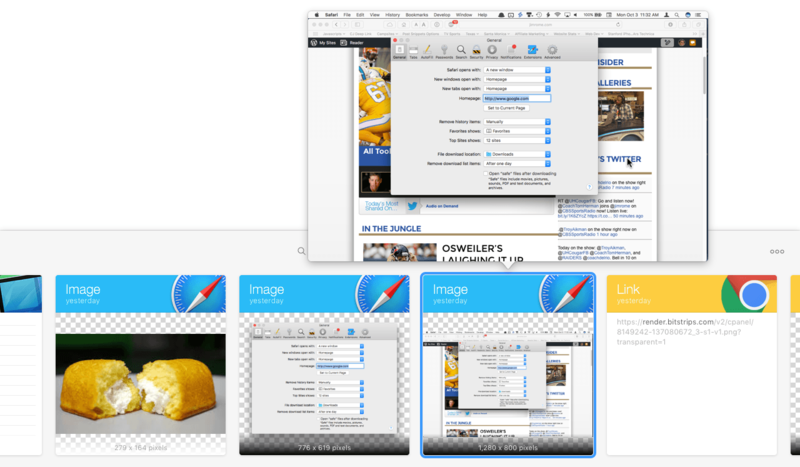 Paste will change the way you use your Mac, and change it for the better. You’ll be more efficient, and those “Aaaargh, I copied a second thing and it wiped out the first thing” episodes will be eliminated. I wish I’d have had Paste installed from Day 1– would have saved a lot of time and trouble. Paste requires macOS 10.10 or higher. 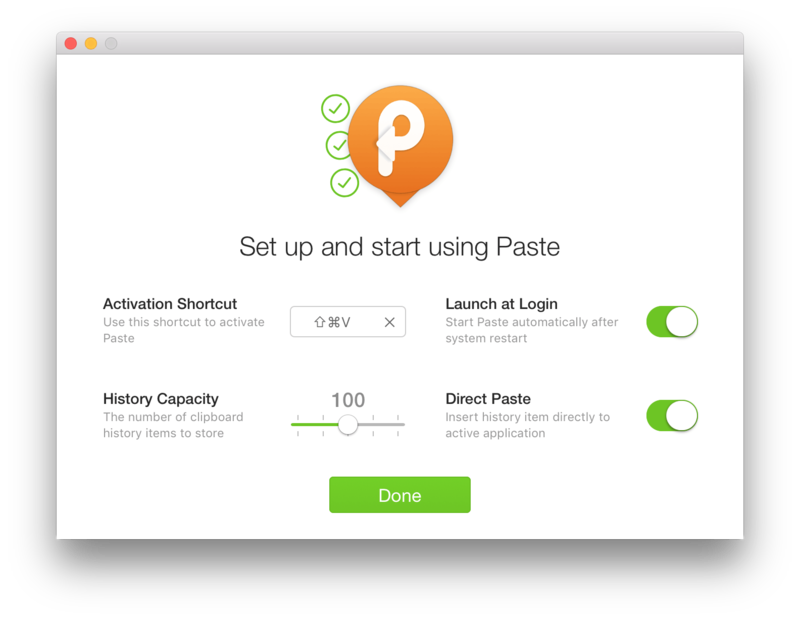 Get Paste at the Mac App Store.